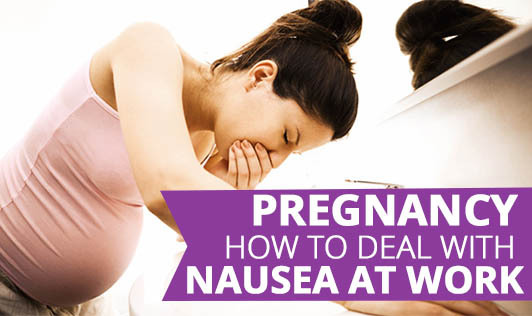 About 75% of pregnant women have nausea during pregnancy and dealing with it along with work is very challenging. • Snack frequently: Food might be the last thing on your mind but it would be the best thing to calm down your stomach and keep you energetic. You can try snacking on biscuits, crackers, puffed rice or dry fruits. • Carry packed lunch: It is definitely not a good idea to have deep-fried and junk food during pregnancy. Opt for food high in carbohydrate and protein which will help relieve nausea and makes you feel energetic. Pack things like whole-wheat snacks, grilled chicken, low-fat yogurt or bananas. • Avoid social dining: If certain smells trigger nausea, then do not hesitate to decline an invitation to lunch or dinner. Avoid going to the company cafeteria and pass on the regular happy hour gathering. • Stay hydrated: Try drinking fluids between meals and in small amounts frequently. If you fill yourself up with fluids, then it becomes hard to eat. You can use a straw to take in small sips. Room temperature drinks are more apt. If you have been vomiting a lot, then it becomes a priority to replenish some nutrients which can be done by taking glucose salt and potassium water (like Electral). A fruit smoothie or vegetable soups can also soothe the stomach while providing some solid nutrients. It is always wise to have an emergency kit containing wet and dry face tissues, a mouth freshener like mint or a ginger tea bag. Your state of mind also has a direct impact on the reactions that are happening in your body. So, be positive, peaceful and keep smiling!